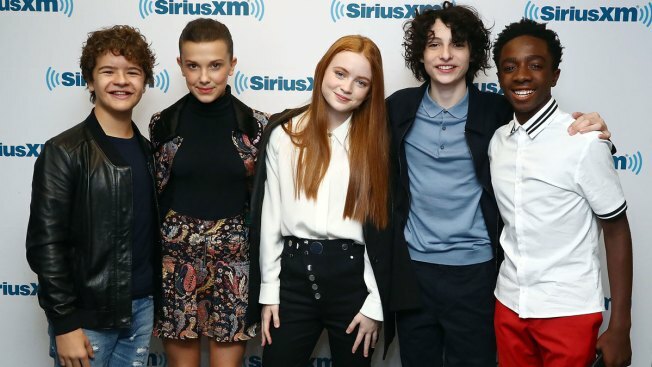 (L-R) Actors Gaten Matarazzo, Millie Bobby Brown, Sadie Sink, Finn Wolfhard and Caleb McLaughlin attend SiriusXM's 'Town Hall' cast of Stranger Things on SiriusXM's Entertainment Weekly Radio on November 1, 2017 in New York City. The series was just greenlit for a third season. Get ready to go back to Hawkins! With plenty of unfinished business lingering as "Stranger Things 2" came to a close, Netflix has announced that the Duffer brothers' highly-popular '80s homage will officially return for a third season in 2018. The streaming giant made the announcement via Twitter on Friday, Dec. 1, first opening things up with a poll of its followers, asking, "Should we make another season of Stranger Things?" They followed that up with an answer to their own question: "FOR THE LOVE OF STEVE, DUH! So hold tight baby darts -- season 3 is officially happening." When season two premiered, creators Matt and Ross Duffer told E! News that they were only two days into writing the new season, but they were able to confirm one major detail about the new set of episodes. "There will be a time jump for sure," they told us. For more of what we know about the new season (so far), read on! Stranger Things stars Winona Ryder,David Harbour, Finn Wolfhard, Noah Schnapp, Millie Bobby Brown, Caleb McLaughlin, Gaten Matarazzo, Cara Buono, Natalia Dyer, Charlie Heaton, Joe Keery, Dacre Montgomery, and Sadie Sink.